Violence erupted in Ikere Ekiti on Friday night and continued till Saturday morning when supporters of the two monarchs in the town clashed while celebrating their traditional festivals. The Odun Oba and Olosunta festivals are celebrated by the Ogoga, Oba Adejimi Adu Alagbado, and the Olukere, Oba Ganiyu Obasoyin, respectively. Soldiers, riot policemen and men of the Nigeria Security and Civil Defence Corps were deployed in the Odo Oja area to forestall a breakdown of law and order. The Odun Oba reached its peak on Saturday with paying of homage and celebration of the ‘New Yam’ — the same day the Olosunta began. 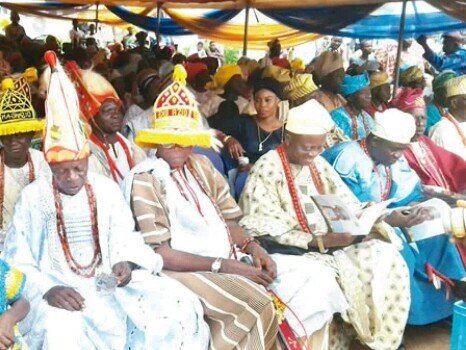 Ogoga accused the Olukere of sending thugs to attack the palace queens on Friday while performing a traditional dance at some locations in the town. But the Olukere alleged that security men working for Ogoga invaded his palace at about 1.00am on Saturday shooting sporadically. He also alleged that the billboard mounted in the Odo Oja area to advertise the Olosunta festival was vandalised by the Ogoga’s loyalists. He said, “Ogoga’s security men shot one of my boys, Oladimeji Aluko, and he was rushed to the hospital for treatment. “I am indoors because the Olosunta festival commenced today (Saturday). Information reached me that they invaded my palace and fired gunshots. “When they could not find me, they went to my private residence in Ado where they were resisted and they shot somebody there. However, Oba Alagbado described the Olukere as an impostor because he had not been recognised as a king by the state government. He said, “Yesterday (Friday), all the palace queens danced from the palace to the Post Office area; the land belongs to the Aladeselu family.